Early in World War I reports circulated that Germany was planning to build new submarines that had a faster submerged and surfaced speed than the current British and German subs. The rumours were that they would be able to do 20 to 22 knots on the surface. It was decided by the British Admiralty that new submarines were needed and that they should have surface speed sufficient to be able to keep up with other ships in the Royal Navy. As it turned out, the reports about the speed of the new German submarines was incorrect. As a result, plans were put in place to develop a totally new class of submarine. This was to be called the J Class. The original plan was for eight sub marines but this was reduced to six and then increased to seven. The subs were originally planned to be numbered J1 to J9 but as a result of the change, the boats intended to be J7 and J8 were renumbered in April 1915 as J3 and J4 respectively. I am not really sure what this means, as J7 was built. Why not just not build J7 and J8? I assume that the numbers were J1 through to J8. On 2 February 1916, J4 was launched from the Pembroke Naval Dockyard, England. The new submarine was 275 feet 9 inches long (approx 82.5 metres) long and 23 feet 3 inches (approx 6.9 m wide) and a draught of 16 feet (approx 4.8 m). It displaced 1,210 tons surfaced and 1,820 tons submerged. Power came from three 1,200 hp 12 cylinder Vickers diesel engines (total 3,600 hp). One engine directly drove the centre prop and the other two charged the batteries. When submerged it was powered by two 675 hp (or 700 hp?) electric motors (total 1,350 hp). The electric motors could also be used in conjunction with the centre engine when surfaced. These engines gave the J4 a speed of 19.5 knots when surfaced and 9.5 knots submerged. It had a range of 4,000 miles (6,400 kilometres) at 12 or 14 knots when surfaced and 2,000 miles ( km) when submerged. 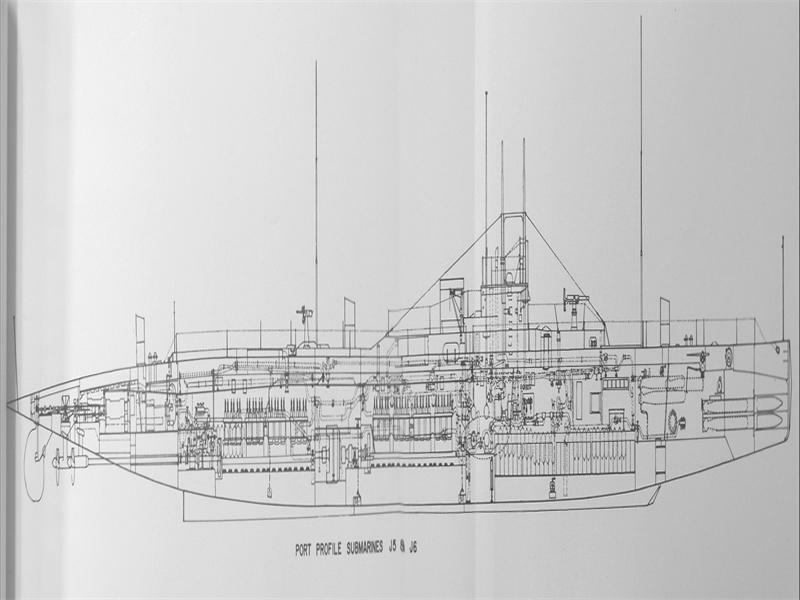 Armament for the new submarines was six 18-inch torpedo tubes, four at the bow and two abeam. 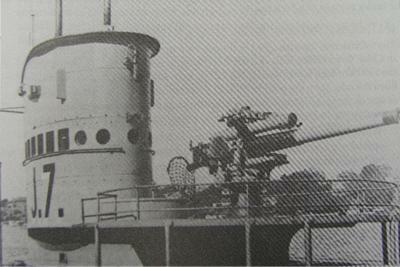 There was also a single 3 inch deck gun which was later changed to 4 inch. The submarine was crewed by five officers and 40 or 41 sailors. 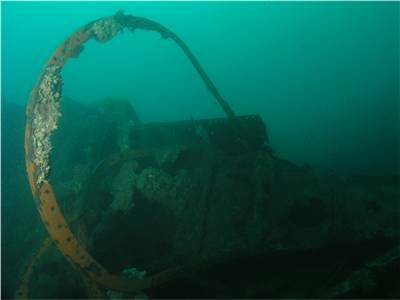 Periscope depth was 28 feet (8.5 metres) amd maximum diving depth was 300 feet (99 metres). HMS J4 was commissioned in the Royal Navy on 17 July 1916 and the first Captain was Lieutenant Commander D.I. McGillevie RN. She took up duty with the 11th Submarine Flotilla based at Blyth, Northumberland. 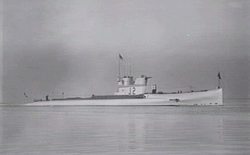 A unique feature of the J series submarines was that they were the only three shaft submarines ever built. From 15 to 24 June 1917, J4, together with her sister submarines J1, J2 and J5 was involved in Operation BB. This was a plan to force German submarines to travel submerged through certain areas that were heavily patrolled by destroyers. It was then hoped that the U-boats would be later on the surface when passing through adjacent areas patrolled by British submarines. It is believed that 19 German submarines passed in or out of the North Sea during this operation. Of these, 12 were on their way back to Germany and the other seven outward bound. The British vessels made 26 sightings and they subsequently made 11 attacks, of which eight were by destroyers and three by submarines. J4 saw no action. On 23 April 1918 a British was convoy sailing between Norway and Scotland. Some of the German fleet made an attempt to intercept the convoy. Four British submarines were patrolling the area, including J4 and J6. J4 did not see the German ships and the skipper of J6 thought that they were British through the fog. No attacks were made by either side. When the end of the war came on 11 November 1918, J4 was being refitted at Chatham. After the War was over the British Government decided to give the Australian Government six of the J-class submarines. There were only seven remaining submarines, the J6 had been attacked and sunk by a British ship HMS Cymric in 1918. All the donated submarines were commissioned into the Royal Australian Navy on 25 March 1919 at Portsmouth. The beam tubes were removed from all the submarines before they sailed for Australia. These were sent separately to Garden Island, Sydney. It was said that the beam tubes were not successful and that increased accommodation was required. J4 was skippered by Lieutenant Ambrose N. Lee RN with officers First Lt E. V. Hume-Spry, Artificer Engineer D. G. Lloyd and Sub Lt L. L. Watkins. J4 had burnt out a main motor and needed repairs, this delayed sailing of the fleet. On 8 or 9 April 1919 (there are various dates given) the six J-class submarines (J1, J2, J3, J4, J5 and J7), escorted by the Australian submarine tender, HMAS Platypus and the light cruiser HMAS Sydney, sailed from Portsmouth. They arrived at Gibraltar at the entrance to the Mediterranean Sea on 14 April 1919 with J2 and J7 arriving the next day. At noon on 16 April 1919 they all sailed for Malta and on 20 April they arrived at Valetta, Malta in the Mediterranean. All of the submarines had engine problems on this leg of the trip. It is said that this was because HMAS Platypus could only do 9 to 11 knots and the submarines 10 knots when using the direct centre shaft only. This meant that the subs had to continually put their gearboxes in and out of clutch to slow their speed to that of the support vessel while still ocassionally charging their batteries. From Valetta, they sailed for Port Said in Egypt. During the night of 28 April 1919 J3's starboard main engine shaft broke. The flotilla arrived the next day in Port Said, Egypt. On 30 April 1919 they left Port Said with HMAS Sydney towing J3. They arrived at Aden on 5 May 1919 after travelling through the Suez Canal. The same day the light cruiser HMAS Brisbane also arrived. She had left Portsmouth eight days after the other vessels. On 7 May 1919 (or 8 May) all sailed for Colombo, Ceylon (now Sri Lanka). HMAS Brisbane had taken over towing J3 while HMAS Sydney was towing J5 as she now also had engine problems. Most (including J4) arrived in Colombo on 12 May 1919 while all were there by 16 May 1919. On 15 May 1919, Brisbane left with J5 in tow. They arrived in Sydney on 27 June 1919. Repairs were made to J3 at Colombo. On 31 May 1919, Sydney left Colombo with J1, J2, J4 and J7. On 2 June 1919 Platypus and J3 left. They met at Singapore and on 18 June 1919 they all left Singapore. HMAS Sydney left Singapore a few days later. On 29 June 1919, HMAS Platypus and the five subs arrived at Thursday Island at the tip of Cape York, Queensland. On 5 July 1919 they sailed to Brisbane (Moreton Bay) before arriving in Sydney, New South Wales, on 15 July 1919. The submarines were refitted at Sydney's Garden Island Dockyard. This refit appears to have taken the best part of six months. The combined value of the submarines was £1.5 million. They were in such poor condition that the Royal Australian Navy had to spend £407,000 upgrading them. On 4 Ausust 1919 J4 and J5 started their refit. Four months later they were still not ready and it is said that they were awaiting hyroplanes and other spares. As the submarines were gradually refitted, they sailed from Sydney to their new base, Geelong, Victoria. After the refit, J4 and J1 (with Platypus) sailed on 16 February 1920 for Geelong. They arrived in Geelong (south-west of Melbourne, Victoria) on 19 February 1920. On 25 May 1920, J1, J2, J4 and J5 undertook six days of exercises out of Geelong. They then sailed to Sydney, arriving in Mosman Bay (north side of Sydney Harbour) on 3 June 1920. They were awaiting the arrival of His Royal Highness the Prince of Wales in HMS Renown. The next month was spent in Sydney waters exercising. On 3 Sepetmber 1920 J4 sailed from Sydney for Geelong. In August 1920 the submarines simulated attacks on HMAS Australia outside Port Phillip Bay heads (this is the entrance to the bay that has Melbourne and Geelong on its shores). On 13 January 1921 J1, J2, J4 and J5 left Geelong for Hobart, Tasmania. They arrived there on 16 January 1921 with HMAS Platypus and HMAS Swordsman in company. This created huge public interest as Hobart had never seen submarines or this many warships. 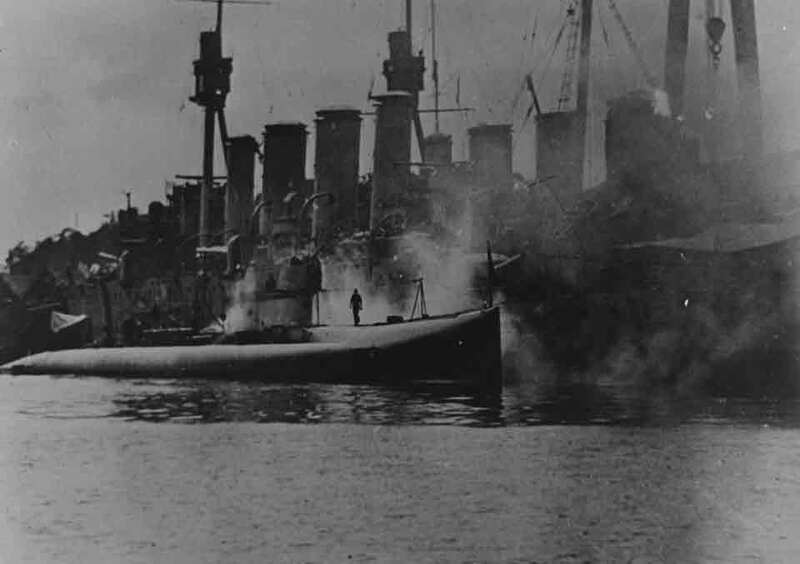 On 21 January 1921 J2 and J4 went out into Storm Bay (the bay that leads to Hobart) and simulated attacks on HMAS Sydney. The Sydney had the Governor General of Australia on board. On 24 February 1921 they sailed to Sydney, arriving a few days later. From 3 to 16 March 1921, J4 and J5 exercised off the NSW South Coast, especially off Jervis Bay. In April 1921 J4 travelled back to Geelong with J1 and J7. On 4 October 1921 the Minister for the Navy authorised the payoff of J1, J2 and J5. J3 and J4 went to Hobart in February 1922 where they exercised for one month. On 20 March 1922 J1, J4 and J5 moved to the new Flinders naval base at Westernport, to the east of Port Phillip Bay. Budget cuts of £500,000 for the Navy meant that more cuts needed to be made. As the submarines were so very expensive to maintain and run, on 22 November 1922, the Minister for the Navy approved the disposal of all the submarines. 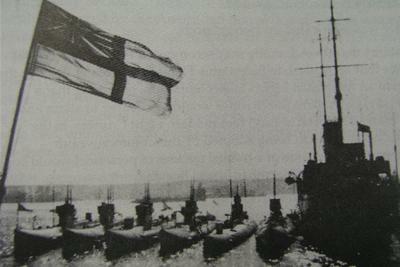 J1, J2, J3, J4 and J5 were decommissioned into Reserve at Westernport, Victoria, on 12 July 1922. Some time later, J3 was towed to Swan Island, Queenscliff (the western side of Port Phillip Heads), to be used as a power station and pier while J7 (which was last to be refitted) was kept in reserve. On 26 February 1924 the Melbourne Salvage Company purchased J1, J2, J4 and J5 for £10,500. The Company was under a bond of £1,000 to the Defence Department as guarantee of the final destruction of the submarines. In the Melbourne Argus newspaper on Tuesday 29 July 1924, it was stated that the machinery, equipment and hulls of the four submarines would be auctioned on 5 and 6 August 1924 as separate items. J4 sold for £225. At 4.30 pm on 10 July 1924 J4 sank at Williamstown Dockyard wharf. It was not till 26 November 1926 that the sub was raised. However, after she was moved a short distance she sank again. She was later raised again. In 1929 the Harbour Trust sued the Commonwealth Government for £2,334 "being the cost of removing a nuisance , to wit, the submarine J4". It ended up in the High Court as it had to be decided if the J4 was a war vessel or a museum curosity. J4 was scuttled on 28 April 1927. During 1927 J1, J2 and J5 (as well as J4) were scuttled about a kilometre from each other in the Commonwealth Disposal Area No. 3 (also known as the "Ship's Graveyard") off Port Phillip Heads. The hull of J7 can still be seen in the Sandringham Marina between two arms of the marina as can the hull of J3 near Swan Island. HMAS Platypus was also paid off as a submarine tender around the same time (12 July 1922) but recommissioned the next day as a destroyer depot and repair ship. The western headland of Port Phillip Heads is Point Lonsdale. 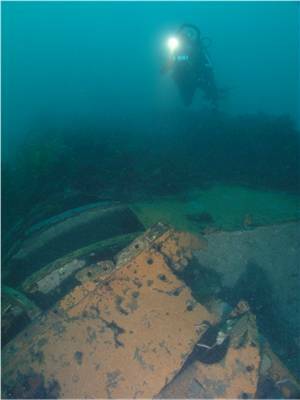 Today, the wreck of the submarine is located about 4.5 kilometres east of Point Lonsdale. The GPS mark for the anchoring spot is 38º 18.060'S 144º 33.730'E (note that all my GPS Readings are usually taken using AUS66 however I am not sure if this is AUS66 or WGS84 - see my GPS Page for more details). It is a 20 to 25 minute trip out from Portsea to the wreck's location. Diving on this wreck is conducted in a manner totally different to how we dive in Sydney and how I have dived virtually everywhere else in the World. For some reason, rather than anchor on or near the wreck, the boat drops a small anchor with a rope and buoy on the wreck. You are then dropped near the buoy and descend down the line. Ascent and safety stops are also done on the line (I have only ever dived without being anchored when drift diving and when diving the nearby dive site of The Zoo at The Rip. I have no idea why this method of diving is carried out, there did not appear to be any apparent reason to me (as there did not appear to be any reason that charter boats have to hoist a red and yellow flag when crossing the heads). Note that in any sort of swell, this wreck can be potentially dangerous. The swell can push a diver into the wreck, either hurting you if you were to hit the wreck, lose a bit of gear or trapping you inside. The J4 now faces due south. The vast majority of the submarine sits upright on a bottom that is a mixture of sand and rock. The first thing you will notice as you near the bottom at 26 metres is that this was a big vessel. The hull is almost square looking and sits well off the bottom. The top of the hull is about 22 metres. Starting from the stern you will see the hull tapers down to a wedge shape. There are stern planes on either side of the hull and a large opening on the top. Presumably this was where the beam tubes were located. Note that if you are over this hole you may get pushed around as water comes streaming through the hull (as per the warning above). On my dive here I was pushed up so quickly that my Aladin dive computer recorded it as a too quick ascent. Along the hull, which is mostly fully intact, there is the occasional small hole. These are sometimes in the deck or the hull side. About 20 metres from the stern there is a very large square hole in the deck. This provides access to the hull. Again, be very wary of entering the hull. Further along there is a very large damaged section of hull (see the photo above right). A short distance further you will see the conning tower. This sits up about three metres off the hull (about 19 metres deep) and is fairly large. You can see the hatch from the top of the tower and there is a hole on the port side. If you look inside this hole you will see another hatch below. A bit tight I reckon, I would not like to have had to slide down in a hurry. 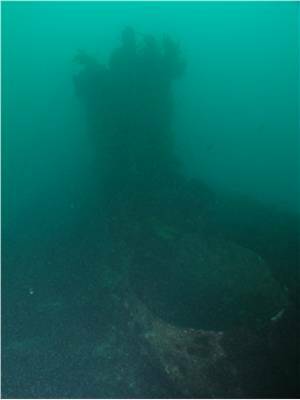 On the stern side of the conning tower you will see the remains of the periscope. In front of the conning tower the hull does not go very far before it comes to an end. The submarine is totally snapped in two here. The bow section (about 15 metres perhaps) is lying on its starboard side. This is the most broken part of the submarine. Not only is the hull snapped, the bow is almost totally opened up. As you can see from the photograph at right, the hull plates are missing on most of the bow. It is said that the torpedo tubes are visible here but I did not notice them. However, in the photo at right, there appears something that may be the torpedo tubes. This is located in the lower left part of the photo, behind the semi-circular hull member (the "ring"). On the way back to the buoy line, have a look into the hull at the break. This is very large and could easily be entered in very calm seas. However, remember my earlier warning. Examine the hull as you go and you may see other things that you have missed on the way up. I should mention that the hull is covered in a fair bit of growth, short weed or kelp as well as some sponge life. There are also a few fish, blue devilfish can also be seen. You will get at least 26 to 30 minutes on the wreck without getting into decompression. On my one dive here in February 2005, I had visibility of at least 15 metres and the water temperature was 19ºC. A dive that was surprisingly good. Worth doing quite a few times. I used Melbourne Diving Services and can recommend their service. See Melbourne Page for more details.